Explanation: The Vela pulsar was born 10,000 years ago at the center of a supernova -- an exploding star. In this Chandra Observatory x-ray image, the pulsar still produces a glowing nebula at the heart of the expanding cloud of stellar debris. The pulsar itself is a neutron star, formed as the stellar core was compacted to nuclear densities. With a strong magnetic field, approximately the mass of the Sun, and a diameter of about 20 kilometers, the Vela pulsar rotates 11 times a second. 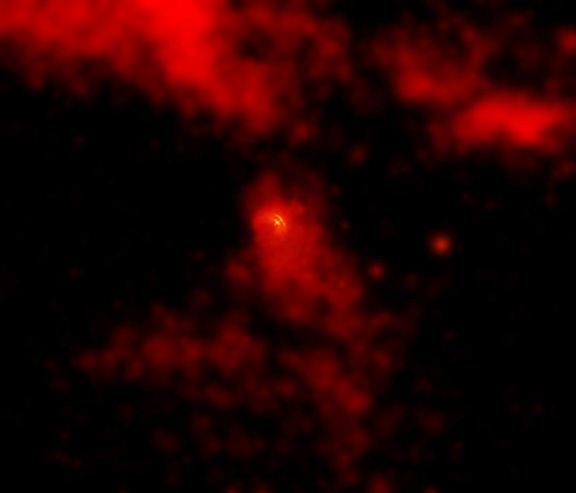 The sharp Chandra image aids astronomers in understanding such extreme systems as efficient high-voltage generators which drive structured winds of electrically charged particles. An x-ray bright nebula is created as the pulsar winds slam into the surrounding material. This view spans about 6 light-years across the central region of the much larger Vela supernova remnant.